Sailing is a hobby and sport. This is supposed to be fun. This is meeting new people, visiting and sharing information. This is to satisfy our human interest in tinkering and the competitive spirit. And so in the having, sailing has become organized with a recorded history. It begins with a hull and some numbers. Boat registrations and a Class Registry is to provide legal status for a boat and its hull, as part of organized racing and secure the lineage of the model yacht. All new hulls produced by an approved manufacturer will be certified by the manufacturer by molding into the hull interior a specifically prepared label issued by the class. The information on this certificate will be recorded in the Class Registry with the buyer's information before hulls are shipped. A fee for this recording is included in the price of the hull and will be paid to the class by the manufacturer. 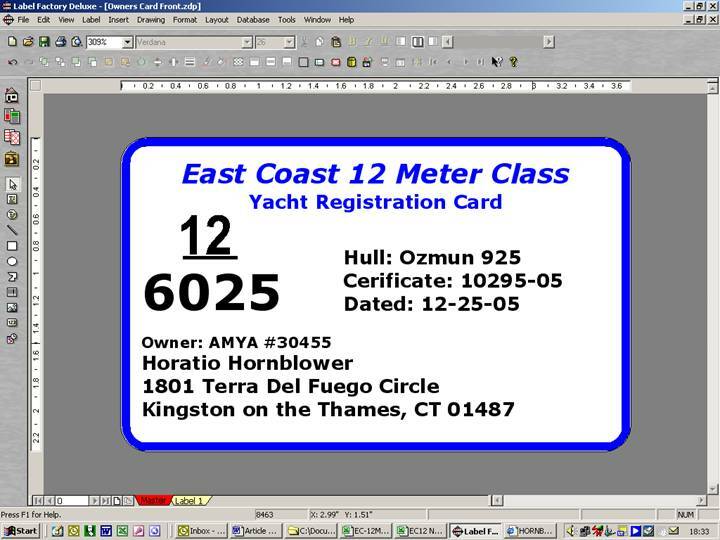 Members of the American Model Yachting Association (AMYA) with current standing will receive an owner's packet with a Yacht Registration Card (YRC). Once a hull is registered, labeled and recorded, it is not likely the class will change the label certification unless the hull has been destroyed. A hull or boat that has never been registered previously and recorded in the Class Registry is not likely to be accepted in this day of a one-design hull and boat specifications for a restricted one-design class. Such requests are to be sent to the class secretary and will, if grandfathered by the class, be considered with verifications or documentation or both. The transfer of a previously registered hull or boat to a new owner should be recorded with the class secretary. A stated fee should be paid to the class by the new owner. AMYA members will receive an owner's packet and a YRC. Sellers should advise the class of hull or boat transfers to non AMYA buyers so the lineage can be contiguous in the Class Registry. · Yacht Registration Number (YRN). 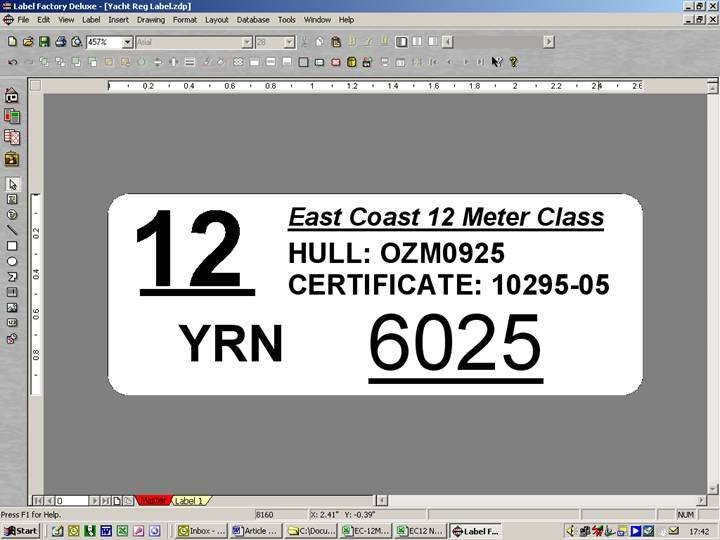 This is the hull ID number and used for sail markings. · The manufacturer’s designator, three letters and a four-digit serial number. · A five-digit certificate number. Some may have a year designator on the end. The label is 1 x 2-5/8 inches. This is for an Ozmun hull with a serial number of 925. The certificate indicates that it was the 295th one registered since 1 January 2005. The YRN is what goes on the sails or just the 25 if you prefer. All numbers of the YRN are recommended on the mainsail. That label is not be changed by the class administration for the life of the boat. This means that once all three numbers above are molded to the hull, it becomes a VIN number and will be about as intractable as a road vehicle. This will provide you with the same ownership qualities as your car and will identify the boat in the marketplace for what it is. What does this mean to you when you order new a hull? If you would like YRN consideration and availability, you should communicate this to the builder or the class secretary before the hull is finished. Once the label is in the hull she is certified as such. The manufacturer will send to the class secretary (CS) the personal information on the buyer that you will see on the registration card below. They may ask you to send that information via an electronic form on the class site. The manufacturer will then pay the class fees required in this process and charge you accordingly in the price of the hull. Hence, there are no transactions you need with the class. The CS will send to the manufacturer a completed label for the hull and to you a registration packet with a Yacht Registration Card. It is most likely you will receive the packet before shipment of the hull. During this process all the information about the owner and the hull will be entered into the Class Registry. It does not matter if the buyer is a member of AMYA or not. The boat is to be certified and therefore be identified in the marketplace as such regardless of owner status. This is your personal card and is not to be transferred to another. This card will identify you and the boat in the marketplace and before race officials at events where it is required. If you lose the YRC, they can be requested from the CS. Such cards will state the reissue date in red below the original registrations date. Complete the registration E-form with current contact information, boat information and your comments in the comment box including the date of registration on your card. This is for verification and a new card will be sent to you. When you commission the building of a boat the hull will arrive at the builder, as it would to you, registered to you and the certificate molded in the hull. Once again, there is nothing for you do and the process above will follow. 1. All new EC12 hulls will be certificated and registered before they are shipped from the manufacturer. 2. There is no need for a buyer to register a new hull or boat. 3. Boats currently in the Registry and from now on may not have their information changed. 4. 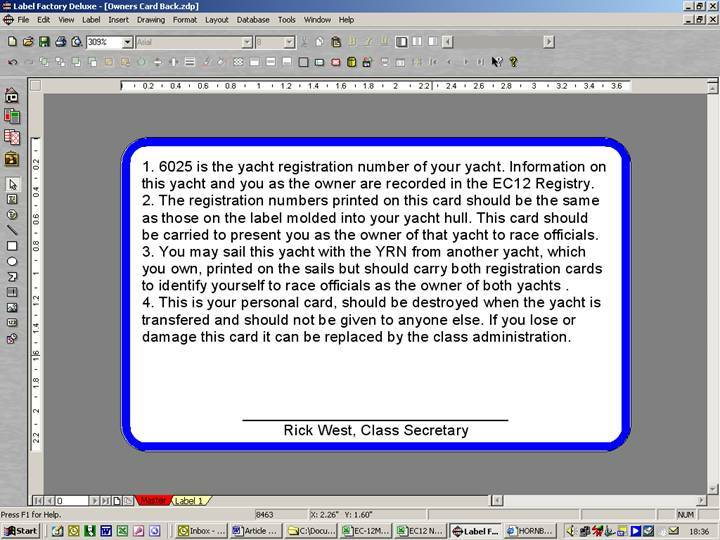 The YRC identifies the owner of the boat stated on the card and matches the label in the boat. The two are a legal unit at sanctioned events. 5. Read the back of the card for a convenient exception and you will see another YRC needs to be present at sanctioned. To make the registration process convenient and with good communications, the class has provided an electronic form on the class website. The form is automatically emailed to the CS when filled out and submitted. It is important to fill out this form completely; all of the contact information, make sure your email address is correct and either the NEW section or the TRANSFER section for what you would like to do. If you have special requests or other information, please use the comment box at the bottom of the form. Shortly you will receive a confirmation from the CS. You currently have a traveling CS but response is usually within a couple of days. You can use this form for other things. Fill out the contact information and explain what you would like to do in the comment box. You can pay online with a credit card through PayPal, an online money transfer company. There are no fees to use this service to the sender. All that is needed is to create an account and login. It is easy to do and convenient for other applications. Through this service you can send money to anyone with an email address. Should you not like to use these services you can copy the form to your printer and mail it and the fee to the CS. All the information to do this either way is on the form.